If you want to make a sartorial statement, look great and lead the way in fashion boldly, dress up in a smart cocktail dress. There are colors, cuts, and styles to suit anyone wanting to wear a cocktail dress. Go with a simple and sleek cocktail dress or go one step ahead and choose one that's an interplay of prints and patterns—have it your way. If you want to stand out in a crowd, get yourself a cocktail dress made of sequins fabric. All the shimmer and glitter will definitely get you the eyeballs you want. However, if you’re a wall flower, choose from designers’ understated but chic cocktail dresses. Your cocktail dress could be perfect for an upcoming wedding, engagement party or any other classy celebration. With a cocktail dress, however, you can never go wrong. You may be a busy career woman or a homemaker. But when surrounded by work, the last thing on your mind is to keep abreast of the latest fashions. Of course, there may be times when you're invited to a cocktail party. What do you wear? If you have a penchant for classy dressing, opt for cocktail dresses made of sequin fabrics. The colors, cuts, and designs are all your decisions, based on your body type. If you have an athletic figure, why not try a mermaid sequin cocktail dress that will flatter your figure? Here are five options that will give you an idea of what’s available in stores online and offline. Take a look at the styles, colours, and cuts and choose the one you want to go with. 1. Twinkling silver shine: From the house of Jovani comes this innocently suggestive gunmetal silver cocktail dress, made of stretch sequin fabric and 100% polyester. It is a fitted short dress made especially for women with gorgeous figures. This dress is embellished with sequins all over, beginning with the neckline and down to the hemline. The racer back is also heavily sequinned. 2. Maroon magic with sequins: Here’s a head-turner. This one is short and off-the-shoulder of this heavily sequinned material. It's just perfect for that cocktail party, and what with the material being so heavily embellished, you don't need any jewelry at all. It has a straight neckline, back zipper, and sheath silhouette, this dress comes to you made from nylon, spandex or polyester with a polyester lining. It’s meant for tall women, about 5’8”. 3. 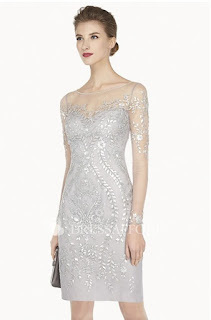 Serene and classy: If this is the image you want to portray, take a look at this sequinned cocktail dress. In pure white, this knee-length dress has a scoop neckline with long and transparent sleeves. It is fully lined and naturally embellished with sequins in an elegant design. 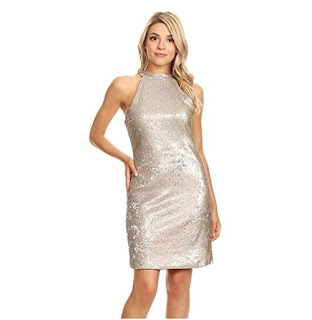 With a dress as twinkling as this, you can enjoy the attention of a room full of people at a cocktail party. 4. Champagne sequins light your way: A slightly loose fitting bodycon party dress hides a zipper at the back and two false toggle fastenings behind the neck. This highly elegant dress is richly scattered with champagne colored sequins that sparkle from all angles. Enter a cocktail party, club, or any gathering and watch the attention grow on you. Made by Anna-Kaci, this cocktail dress is perfect for any classy gathering. 5. Glitter and shimmer: This plus-size dress, designed by SL Fashions, has ¾ sleeves of lace and sequins, performing their own magic on you. An A-line dress with a sweetheart neckline, it is simple at first glance. It is made from nylon and rayon and has a polyester lining. The entire material is embellished with twinkling sequins, which give you a classy look, so much the part at a formal cocktail party. Wear, shimmer and shine! There are as many styles and colors of cocktail dresses as there are reasons to get into them. Take your pick, depending on your figure and the occasion you’re buying one for. Choose to go subdued in a light shade or be bold and brassy in black, maroon or navy blue. Twinkle all the way in your dress of sequin fabric and enjoy the spotlight on you all evening. Cocktail dresses for every occasion | See more ideas about Cocktail recipes, Craft cocktails and Cocktail.